When the people of a small community go to the trouble of putting up a memorial to their neighbors, I always want to know more about those memorialized, especially when the small community is close to my own. Barnard’s World War I memorial made its first appearance in The Road to Barnard, Part 2. In loving memory of Sergeant Leslie T Shapton, Priv. Harry Potter, and Priv. Harold Cole, who gave their lives in France for their country 1917-1918. Erected by Barnard School. We covered the story of Leslie T. Shapton in Part 2. Let’s go on to Harry Potter and Harold Cole. In June, 1918, when he registered for the draft, Harold Cole (Herald James Cole to his family and to the military) was a civilian employee of the United States Government and living in Hyattsville, Maryland (a suburb of Washington, D.C.) I have no idea what his job was, but it didn’t exempt him from the draft. In short order he found himself in the army. He came back to Michigan just long enough to marry Myrtle Anderson in August, then headed off to Camp Custer in September. He arrived in France on November 11, 1918, the day the Armistice was signed. He very likely never saw a day of combat, but there are many ways to die in war. In February, 1919, his parents received a telegram. Their son–their only child–had died of cerebro-spinal meningitis. He was 22 years old. He was buried in France. On the twenty-third of June a ship arrived at Hoboken, N.J., bearing the bodies of many of America’s soldier dead. Some have already arrived home draped in the flag for which they gave “their last full measure of devotion,” but this ship is of special significance to the people of Charlevoix county because it brings back the remains of Harold Cole. On July 2 he was reinterred at Maple Lawn Cemetery in Boyne City. When I see Harry Potter I think of a bespectacled young wizard with a red-headed friend and an English accent. This Harry Potter, it turns out, was a farmer and red-headed himself. He came from a big Dutch family. 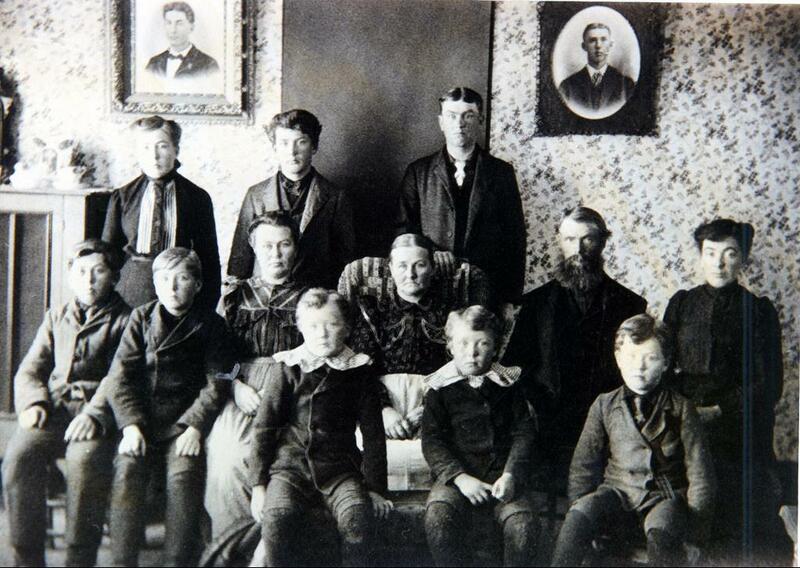 He’s in the front row, third from our left, with a lace collar and short pants. Mercy, mercy, the way we used to dress our young. Harry was drafted in the fall of 1917, and ordered off to Camp Custer for training. Right before he left he married Winnie Sitzema. No time for a honeymoon. There were a few precious days together in the spring, when Harry came home on furlough before shipping out. In July, 1918, his unit sailed for France. That fall the final Allied offensive began. Chaos reigned. Hospitals and burial details were overwhelmed. In October Harry died of wounds suffered in battle; I do not know when he was wounded, or in what part of the chaos. 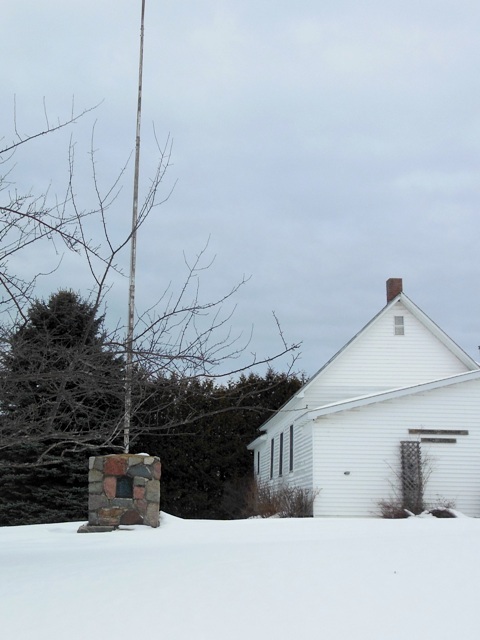 It would be late November before the telegram arrived at the Potter home in Charlevoix–just weeks after the joyful news of the Armistice. Harry had already been buried in France. In August, 1921 the Charlevoix Courier reported that “The funeral of another of our returned soldiers, Harry Potter, took place at the South Barnard church on Monday at 10:00 a.m. A large crowd gathered to pay their last respects to the third of Barnard’s boys to give his life for his country.” He was reinterred at the Atwood Cemetery. The last of Barnard’s boys had come home. I remember my mother talking about “our boys” when she meant the soldiers of World War II. Why, I wondered, did we call them boys? I suppose it was because so many of them were, before they went away. The grief of the three Barnard mothers is not more terrible than the grief of millions of other mothers. But it is not less, either, and I think there is something to be said for paying attention to the cost of war. Minute attention. Life by life. Name by name. There is one more mystery from our trip out Barnard Road. This boulder is tucked away under the branches of a spruce tree. I’m working on it. I hope we don’t have to wait until 2037. I, um, think that might be an excessively optimistic plan on my part. OK. Made me cry. So sad when you realize the personal details of each of the fallen. And to think there are thousands of similar stories of families and wives and parents getting that news. And still it continues. That’s the part that made me cry. I spend a fair amount of time crying over my research. It’s one thing to learn that there were more than 300,000 American casualties in World War I (a number dwarfed by the millions of French and British and Russian casualties). It’s another thing entirely to face the anguish of Edmund and Elizabeth Shapton, and Jerome and Hattie Cole, and Myrtle Cole, and Hiram and Jana Potter, and Winnie Potter. I’m not sure why that is. It doesn’t help that it was a rather pointless war that could and should have been avoided. That seems to be pretty much the consensus of most of the people who actually fought in it– as opposed to the jingoistic hysterical “journalists” of the day. Of course I have no idea how I’d have felt if I had, say, been a resident of Vierzy. As always, the people who suffered were not the people who organised it. In the 60’s there was a poster that said “War is not healthy for children and other living things.” That has always been true. The poetry of Siegfried Sassoon is relevant, in particular: https://en.wikipedia.org/wiki/Base_Details WWI was a war that took out a whole generation of young men. What they might have contributed to the world if the pointless futility of war had not slammed the door on their lives just as they stood on the threshold. . I don’t disagree with your premise. However, I am not optimistic that our species will choose to stop making war. We’ve been doing it as long as we’ve been identifiably “human” and it’s never worked yet. You’d think we’d quit, but on we go. I always heard my family talk about the boys who had gone to war, too. I think the reason’s no more complicated than what you said. They were boys, with all of the enthusiasms, bravery, and lack of cynicism that entailed. I also think this is exactly right: “there is something to be said for paying attention to the cost of war. Minute attention. Life by life. Name by name.” In as many ways as I can, both directly and indirectly, I keep saying it: everything matters. Everyone matters. Of all the trends in our society that I fear and despise, the trend toward valuing the collective over the individual is at the top of the list. It mitigates against both freedom and responsibility, which are crucial for truly human society. I think you have very cleverly ignored the time change. You are getting up just as you always have, and enjoying the day until everyone else is ready to get to work. We have large areas of agreement and large areas of disagreement–as is proper. We live in a fractious democracy, at least at the moment. It seems to me that war is the ultimate “valuing of the collective over the individual.” Of the three Barnard boys, Leslie Shapton enlisted; the other two were drafted. All of them knew they might never come back. None of them, of course, believed it. But was their going their free choice, their responsibility, their fate? And what of the choices and responsibilities of President Wilson and each member of the Congress and each citizen? (We won’t even go into the British Commonwealth or Europe.) I have more questions than answers, but I intend to keep digging for answers, life by life, name by name. It’s useful having you looking over my shoulder. This is the brilliance of our Vietnam memorial, where all the names of those who died are listed in one great huge chunk. You can see the sheer size of the loss. It’s a subtle thing, but once you realize what you’re looking at — not just a few names on this memorial in this town and a few on that one in that town, but ALL the names of the dead, it can be overwhelming. I think the Wall Maya Lin imagined into being has helped many of us reflect on the experience and come to terms with our losses and with each other. I admire Yusef Komunyakaa’s poem Facing It very much. I am in favor of understanding history name by name. The relative of a friend of mine died in the First World War after the Armistice was signed. I wonder how many did. And yes, they were young! Camus wrote, in an autobiographical novel he died before finishing, published years later as THE FIRST MAN, of going to visit his father’s grave and being shocked into feeling something, to his surprise (since he’d never known his father), by realizing that his father had died at a younger age than he was at the time of his visit to the cemetery. We grow used to thinking of certain categories of people as Older. Parents, presidents, professors, peacekeepers . . . Then we age and they die and the next thing you know . . . there we are standing in the rain at the cemetery wondering at the youth of all the people who once inspired awe. Very interesting and thought provoking to read about what has happened to the young soldiers, and also interesting to learn a bit of American history. And the time capsule…I take it for granted that you have a metal detector among the garden tools? and a spade…and you probably know someone who have a excavator, (if you don´t have one yourself). Last thing to do, or perhaps the first, is to change the “3” into a “1”, and there you are, one year left to prepare the digging. I will be following your updates. You are even more devious than I am. I must tell you that the boulder weighs . . . a lot. I don’t know just how much, but it’s a lot. I will be happy if I can find out why the cache is there, even if the contents remain a secret for another 21 years. J.K. Rowling should see this–she would be touched by it on so many levels. As was I. Thank you Craig. The Lady Alicia and I are great admirers of J.K. Rowling and her Harry Potter. I expect she would have liked Barnard’s Harry.